CVS Health on Sunday said it’s acquiring Aetna in a $US69 billion deal. The hope is that by combining the two companies, CVS and Aetna may be able to keep healthcare spending from increasing as much as it has. CVS Health and Aetna are merging, in what’s the largest deal of 2017. The $US69 billion deal creates a new type of company that includes a health insurer, a retail pharmacy, and a company that negotiates prescription drug prices with drugmakers called a pharmacy benefits manager. The merger is intended to shift the way consumers interact with their healthcare. Both CVS CEO Larry Merlo and Aetna CEO Mark Bertolini said the plan is to make pharmacies the “new front doors of healthcare” – as opposed to a traditional doctor’s office or a hospital. 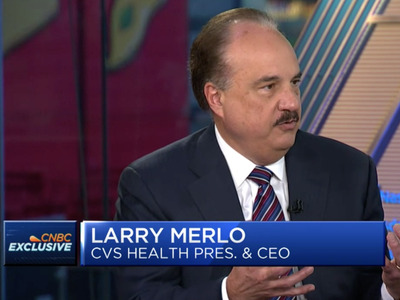 “It was clear that CVS Health was moving to become more of a healthcare company and getting closer to the payers, Mark had a similar strategy in getting closer to the customer,” Merlo told CNBC on Monday. Now, with both companies under the same roof, that’s a possibility. The hope is that a combined company will find ways to curb healthcare spending. “More’s needed to truly impact the trajectory of healthcare spending,” Merlo said in a call with investors on Monday. While CVS might be best-known for its roughly 10,000 pharmacies around the US, CVS as a company operates a number of different businesses, including a pharmacy benefits manager, its MinuteClinic health clinics that are staffed by health care professionals, specialty pharmacy fulfillment and management services, mail prescription services, and long-term care services. If CVS and Aetna are going to make pharmacies the “new front doors of healthcare,” that’s going to rely heavily on services like the MinuteClinics to have a more comprehensive healthcare experience than just picking up that month’s pills. The deal is coming at a time when a number of startups have popped up looking for ways to get prescriptions to people without them having to go into a pharmacy. Getting prescriptions without going to a pharmacy could also gain more momentum if Amazon decides to get into the prescription drug business and starts to distribute prescriptions. Robert Handfield, a professor of supply-chain management at North Carolina State University, told Business Insider in October that one area where this deal would help CVS out is by directing Aetna members to CVS’s pharmacy locations. The actual amount of money prescriptions bring into pharmacies isn’t all that much, Handfield said, it’s what else you buy while you’re at the pharmacy – snacks, drinks, beauty products – that makes pharmacies a booming business. Say that prescription portion went online, it would be much harder for retail pharmacies to compete with convenience stores, grocery stores and anyone else selling candy bars and deodorant. But say you’re an Aetna member, the preferred way to get your prescription might be by going to a CVS pharmacy, bringing foot traffic that might not come organically. Adam Holyk, the chief marketing officer at Walgreens, which has about 8,100 pharmacies around the US, said the appeal of going to a pharmacy in-person includes having a healthcare professonal like a pharmacist to get information from. “It’s not the accessibility of the locations, it’s knowing that there’s somebody there that can answer your questions that come up,” Holyk told Business Insider on Monday.